The Mom Standard: What next? Permanent markers made from veggie juice? What next? Permanent markers made from veggie juice? 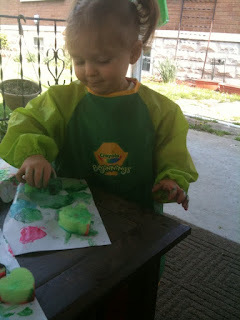 Yesterday while enjoying the spring weather, in between the days of summer and winter, we finger painted. Remember how that stuff smelled when we were kids? Great, right? Not this stuff. Oh no, this finger painting set which included shaped sponges and popsicle sticks (?) smells nothing like that gelatinous stuff we enjoyed in our youth. As we painted, (I trying my best to keep as clean as possible while not squirming since this is a kind of monumental milestone in a child's life and my daughter hiding her contempt for this crap too) my hands started getting sudsy! Yes, I kid you not I started foaming at the hand! When I went to rinse my fingers in the bowl of water I brought out (just like we did as kids), that's when it all clicked...this stuff is non-toxic, food colored, lack of any distinct and memorable smell, SOAP! Marketing geniuses I tell you. Geniuses. I'm sure these geniuses were not behind-the-desk MBA Marketing professionals but well intentioned parents trying to save the world's children from that horrible killer called Finger Paint! As I type I am holding back tears caused by these saviours because I will never be able to share a childhood rite of passage with my daughter. I think back fondly of finger painting (pre-texture issue), triggered by the olfactory memory of it...the only thing she'll think about is washing dishes.